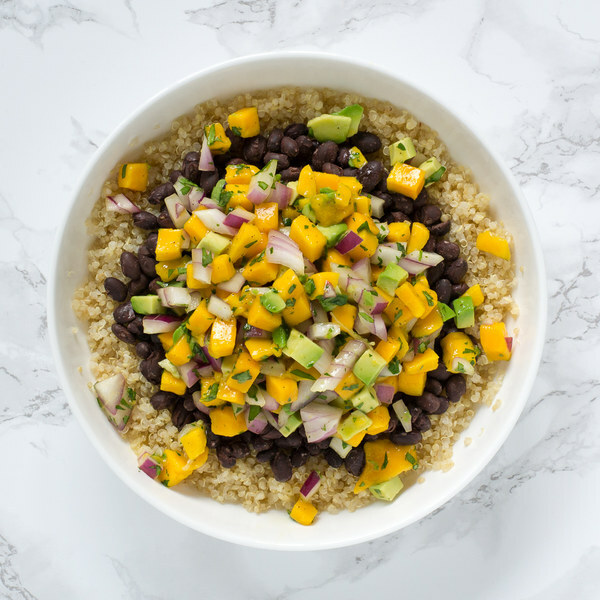 ← Mango-Avocado Quinoa Bowl with Black Beans. In a small saucepan, combine the quinoa and water; bring to a boil over high heat. Drain and rinse the black beans in a colander; set aside to drain further. Once the liquid comes to a boil, stir the mixture, cover the saucepan, and reduce the heat to low. Cook the quinoa for 15 minutes. Once done, remove the quinoa from the heat and let it stand, still covered, for 5 minutes. Juice the lime and transfer to a medium salad bowl. Peel the mangoes, then slice off the flesh from the pit, starting with the flatter sides; discard the pit and small dice the flesh into ¼-inch cubes. Add to the salad bowl. Halve the avocado lengthwise and twist the halves to separate, then remove the pit with a knife or spoon; scoop out and small dice the flesh into ¼-inch cubes. Add to the salad bowl. Trim off and discard the ends of the onion and remove the outer layer; small dice the onion into ¼-inch pieces. Add to the salad bowl. Once the skillet is hot, add the black beans and cook until heated through, 2 to 3 minutes. Remove from the heat. Uncover the quinoa and fluff with a fork. To serve, arrange the quinoa, black beans, and mango-avocado mixture in a bowl. Enjoy!